Let's explore the etymology of Hannibal Lecter's name, to see if we can confirm that he represents a personification of evil Jews, and of Satan. Starting with Hannibal's last name, Lecter is related to the name Lechter, which is derived from the name Lichter. Lichter is a German and Jewish (Ashkenazic) occupational surname for someone who made candles or possibly for someone who tended a light, from an agent derivative of from Middle High German lieht, Yiddish likht 'candle', 'light'. [a] Due to this name symbolism, we see that Hannibal Lecter represents Jews, within some context. Left: The nine-branched Hanukiah. 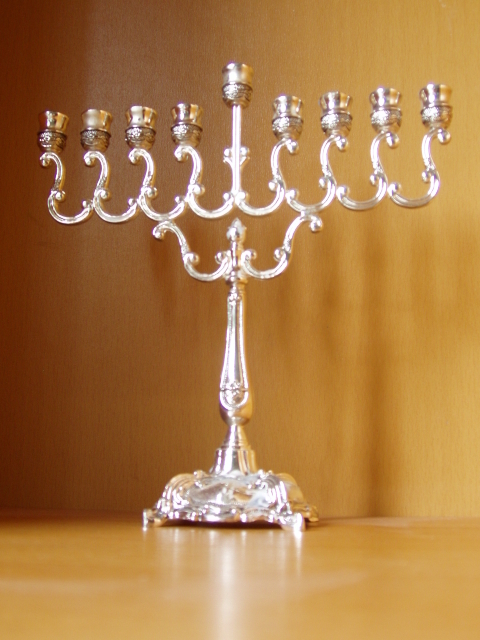 [Image from the Wikipedia 'Menorah (Hanukkah)' page, public domain, via Wikimedia Commons.] Above: Lecter bites Officer Pembry on the face in Memphis. Let us now analyze Lecter's first name. The name 'Hannibal' means "grace of Ba'al" from the Phoenician hann "grace" combined with the name of the god BA'AL. Hannibal was the name of a Carthaginian general known for his cruelty, who threatened Rome during the Second Punic War in the 3rd century BC. [c] BA'AL is a Northwest Semitic title and honorific meaning "master" or "lord" that was used for various gods who were patrons of cities in the Levant. Worship of all such spirits was rejected as immoral, and many were in fact considered malevolent and dangerous. As can be seen, the etymology of Lecter's first name confirms that he represents a personification of Satan, and this taken with his last name indicates a correspondence between evilness and certain Jews. As we've already observed, Lecter represents evil hermaphroditic Jews (recall from part 8 of the analysis, that the hermaphroditic aspect of Lecter is due to the 'femaleness' within him, insofar as he corresponds to the witch, Baba Yaga). b. Wikipedia, 'Hanukkah'. Web, n.d. URL = https://en.wikipedia.org/wiki/Hanukkah. c. Wikipedia, 'Hannibal'. Web, n.d. URL = https://en.wikipedia.org/wiki/Hannibal. d. Wikipedia, 'Baal'. Web, n.d. URL = https://en.wikipedia.org/wiki/Baal.